This movement script will follow the path exactly, it uses linear interpolation to move between the waypoints in the path. This is desirable for some types of games. It also works in 2D. You can see an example of this script in action in the example scene called Example15_2D. This depends on what type of movement you are aiming for. If you are aiming for movement where the unit follows the path exactly and move only along the graph connections on a grid/point graph. I recommend that you adjust the StartEndModifier on the Seeker component: set the 'Start Point Snapping' field to 'NodeConnection' and the 'End Point Snapping' field to 'SnapToNode'. 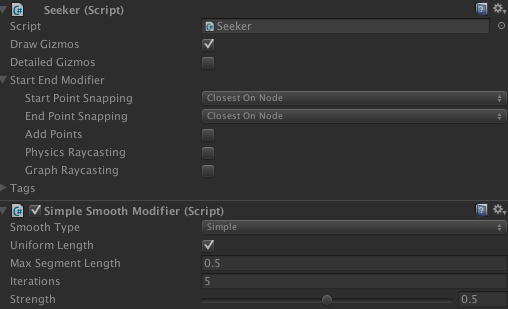 If you on the other hand want smoother movement I recommend setting 'Start Point Snapping' and 'End Point Snapping' to 'ClosestOnNode' and to add the Simple Smooth Modifier to the GameObject as well. Alternatively you can use the Funnel Modifier which works better on navmesh/recast graphs or the RaycastModifier. You should not combine the Simple Smooth Modifier or the Funnel Modifier with the NodeConnection snapping mode. This may lead to very odd behavior. You may also want to tweak the rotationSpeed. Requests a path to the target. If true, some interpolation will be done when a new path has been calculated. This is used to avoid short distance teleportation. True if the end of the current path has been reached. Determines how often it will search for new paths. If you have fast moving targets or AIs, you might want to set it to a lower value. The value is in seconds between path requests. How quickly to interpolate to the new path. If you override this function you should in most cases call base.Awake () at the start of it. Calculate the AI's next position (one frame in the future). The tangent of the segment the AI is currently traversing. Not normalized. Only when the previous path has been returned should a search for a new path be done. Finds the closest point on the current path and configures the interpolator. Time when the last path request was sent. Called when a requested path has finished calculation. A path is first requested by SearchPath, it is then calculated, probably in the same or the next frame. Finally it is returned to the seeker which forwards it to this function. Time since the path was replaced by a new path. 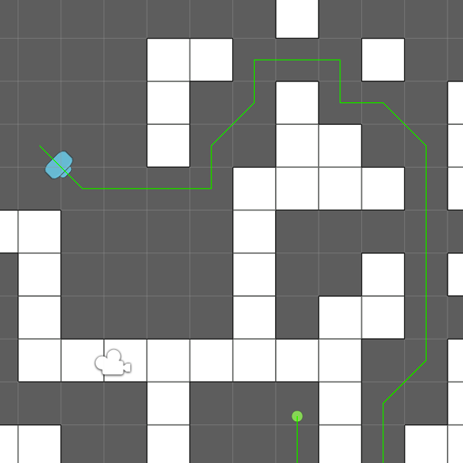 When a new path was returned, the AI was moving along this ray. Used to smoothly interpolate between the previous movement and the movement along the new path. The speed is equal to movement direction. If you override this function you should in most cases call base.Start () at the start of it. Holds if the Start function has been run. Used to test if coroutines should be started in OnEnable to prevent calculating paths in the awake stage (or rather before start on frame 0). Required for serialization backward compatibility. If true, the forward axis of the character will be along the Y axis instead of the Z axis. The AI will try to follow/move towards this target. It can be a point on the ground where the player has clicked in an RTS for example, or it can be the player object in a zombie game. In 4.0 this will automatically add a AIDestinationSetter component and set the target on that component. Try instead to use the destination property which does not require a transform to be created as the target or use the AIDestinationSetter component directly.